AVO Turboworld Endlinks - Dezod Motorsports Inc - Home of the automotive performance enthusiast since 2002. 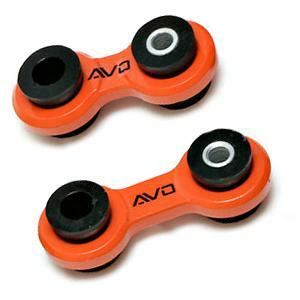 AVO Turboworld Adjustable Stabilizer End Links reduce the amount of free play before your stabilizer bars start acting, reducing roll in corners and squat and dive under acceleration and braking. A low-cost solution to firm up your handling performance. Designed for lower-than-stock suspensions. These rear adjustable Stabilizer End Links reduce the amount of free play before your stabilizer bars start acting, reducing roll in corners and squat and dive under acceleration and braking. Designed for lower-than stock suspensions. Heavy-duty endlinks for heavy-duty users with a low-down suspension. A more flexible bushing design allows for the full range of suspension movement necessary. These steel endlinks are the answer for the big-stabilizer bar setups, especially ones that see a lot of track use. All kits come with 8mm and 10mm sleeves to fit steel or alloy suspension lower arms.